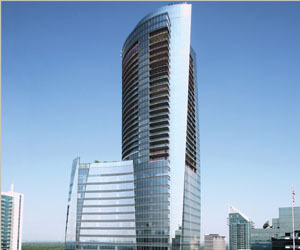 Sovereign, the luxury Buckhead high-rise, will enlist help of the famous Buckhead boutique Pieces to design its new model home. Pieces is known for its unique furnishings and acessories. Owner Lee Kleinhelter describes Pieces’ style as sophisticated yet youthful, stylish yet unexpected. She founded the boutique in 2004 when she saw a gap between the high-end antiques and mass produced items available in Atlanta. Experienced in interior design, her eye for unique compositions has made Pieces a regular with national and local outlets including Elle Decor, House Beautiful, InStyle, Lucky and Architectural Digest. The home she will be designing is a 33rd floor, 2 bedroom 2 1/2 bath, 2,500 square foot condominium in Sovereign’s luxurious residential space. Lee says she is excited to bring unexpected items to this luxury, high-rise setting. The home has floor to ceiling windows, hardwood floors, custom cabinetry, natural stone countertops and 11-foot ceilings. A den, large living room, formal dining room and European-style gourmet kitchen round out the space.